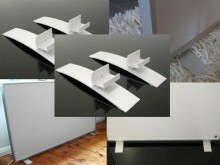 If you want the framed panels to be mobile or for testing out in different rooms then these feet will help. The panel simply drops into the feet which has screws to lock the feet in place and provide a steady base for the heaters. Click the button below to add the Infrared Panel Aluminium Feet - Floor Stand to your wish list.